Gorilla was a special gift from our very good friend Paolo Carnevaletti of Kuorii cattery in Italy. He actually came to us sight unseen, but boy was a pleasant surprise! 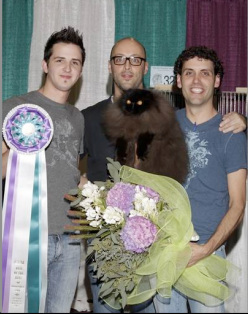 It was with great anxiety and excitement that we traveled to the 2009 Garden State Cat Club show to pick him up. Gorilla was just old enough to compete, and he ended up the highest scoring kitten in show...a sign of things to come! Together we attended a total of 10 shows while Gorilla competed as a kitten, and he was highest scoring at all of them! At his first show as an adult, Gorilla was named "Best Of The Best" at the 2009 CFA International Cat Show in Atlanta, GA. Kuorii and Cuzzoe made CFA history that night as the first and only catteries to breed and own the winning cat twice, and in consecutive years! Although it was a lot of fun showing Gorilla, we love being at home with him even more. He follows us around like a puppy, purrs and talks constantly, and he loves to climb up on our shoulders to bury his head in our hair. He is our baby boy!